Quotes are something we always use as an inspiration or simply to put a smile on our faces. It is, however, difficult to find the ones you are looking for in the huge labyrinth of them. There are so many, as there are more than a lot of inspirational people that have said something that changed the world, or at least changed the perception people had on different aspects of the world. As we are very interested in fashion, a domain that has especially changed very much in the last decades and is in a constant development, we have assembled a list of 67 famous fashion quotes to help you navigate through the development of fashion and not only. Fashion was something that has always existed from the need of dressing to the need of showing different values as well as portraying the wealth of the family. The woman was the “object” of fashion for a very long period of time as she represented the wealth of the family she was part of. Besides, as fashion is considered to have truly started in Paris, during the Marie Antoinette era, her dressmaker is considered to be the first ever fashion designer. Thus, the first fashion quote chosen is from none other than Rose Bertin, Marie Antoinette’s dressmaker. Her talent and her “reinvention” of what was forgotten, put Paris on the fashion map and everybody across the world wanted to dress as Marie Antoinette. She became a trendsetter and Rose Bertin, became famous. Her fame was soon followed by the one of Charles Frederick Worth, a fashion designer in the more famous sense of the word, who changed perceptions and the shape of the dresses to make them more wearable. However, nothing extremely notable happens in fashion until the 1900s when the true fashion revolution starts to shape the world. Until then, the differences are rather small, and there is no big revolution that comes from designs. Working with Worth and with several other designers of that time, he launched into the fashion revolution by changing the shape and perception of the female body. He is mainly forgotten, as, soon after came other big revolutionaries that have changed everything, inspiring themselves from what he started. World War I changed the way people dressed and gave place to simpler looks, less embellishments and different coiffures. It was the time fashion was truly revolutionized and the moment when everything started going faster. With the appearance of Jean Patou, Jeanne Lanvin and Coco Chanel, the fashion world has not seen better times in terms of change and development. Chanel and Patou bringing sporty clothes to the world while Lanvin brought the skillful embroidered look that would later be associated with the name of the fashion house. Just because there couldn’t be a list of famous fashion quotes without mentioning Coco Chanel a couple of times, right? With the introduction of sporty clothing came the response through shoes, with two very big shoe designers Salvatore Ferragamo and André Perugia. The Great Depression followed soon afterward, and it represented a turning point in fashion as it’s effects started being felt all over the world. The two most prominent designers of that time were Elsa Schiaparelli, with crazy colors and surrealist designs and Madeleine Vionnet, with her timeless and beautiful gowns. Then Hermés appeared in the fashion scene, first with handmade printed silk scarves and the expanding into practical innovations such as the zipper. Then came World War II and the fashion world began to crumble, not only in Paris, but everywhere. 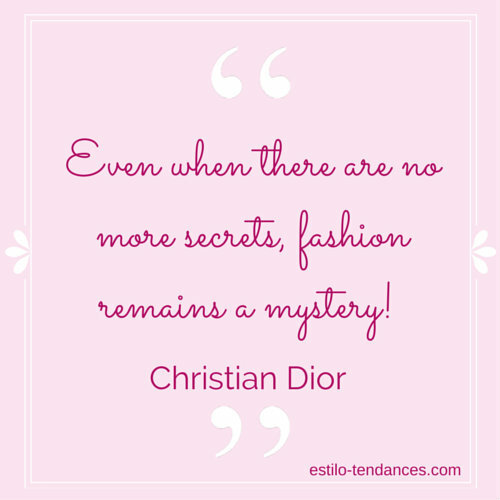 Christian Dior made waves with his “New Look”, portrayed in his first collection. After the 1950s a new style of youth fashion began to emerge, but couture was not dead and it kept going especially through Givenchy, Balenciaga and Balmain. After their (r)evolution, came the 1960s, with Mary Quant inventing the miniskirt, Twiggy gracing the covers of Vogue, Diana Vreeland finding all the new faces, Yves Saint Laurent inventing the tuxedo, Pierre Cardin appearing in the scene and Emanuel Ungaro brought bold colors and baroque contrasts. Besides them, two other notable designers of the 60s, were Pacco Rabanne, with his unconventional use of materials and Emilio Pucci, with his crazy prints. There are a lot of famous fashion quotes from this period and we will start with Mary Quant. Besides the wonderful designers, and new fashion people, the 1960s brought a new era of designer-celebrity partnerships, such as Audrey Hepburn with Givenchy, or Jackie Kennedy with Oleg Cassini. Audrey is famous for all kinds of quotes, but this might be the one that will always make you think about her. With the 1970s, came the era of hippie, of jeans and of tie-die shirts, but also of punk. Some have seen this the era of bad taste, while others took advantage of it, to become new icons in the fashion industry. It was the era where brands such as Kenzo and Sonia Rykiel emerged in the Parisian fashion market, alongside with Vivienne Westwood, the inventor of punk clothing in the British fashion scene. From all the famous fashion quotes that I’ve listed in this article, this one kinda sums up the entire fashion scene – it really comes down just to this in the end: buy less, choose well and make it last. Brilliant. Because in the 1970s fashion began to go towards other continents, British and American fashion emerged. British fashion was characterized by Vivienne Westwood’s punk era that revolutionized the catwalk, while the American fashion scene was graced by the like of Calvin Klein and Ralph Lauren, with their perfectly American relaxed, sporty style. As the 70s were and era of novelty and also, especially in the US, the fashion scene was split between two distinct movements, the tailored, unisex look, promoted by Calvin Klein and Ralph Lauren, and the fluid, and rather unstructured look, promoted by Roy Halston Frowick (known as Halston). Besides him, Geoffrey Beene, known for his elegant and sophisticated cuts and his use of black and white also emerged, followed by Bill Blass and Betsey Johnson. You can’t possibly go wrong by following this quote! Besides Britain and the States, Milan emerged very fast on the fashion map and soon became the 2nd international centre of fashion, after Paris, with designers such as Valentino, Elio Fiorucci, Giorgio Armani and Nino Cerutti. The late 20th century brought the invention of different new materials such as Lycra, which became “a thing” especially in the 1980s fashion, with the whole disco movement. Thierry Mugler and Azzedine Alaia, are two of the French designers that have made their mark during that time, joined by Christian Lacroix and Claude Montana. The 80s marked as well the ascent of Carolina Herrera, but also, of the Japanese fashion scene, with designers such as Rei Kawakubo andYohji Yamamoto that represented the break into the prevalent fashion trends of that time. New York brought its own, through Donna Karan, while the rest of the States gave us Perry Ellis and Adidas, for sportswear and the legendary Manolo Blahnik rose to fame during that period as well. Let’s see what they had to say through these legendary fashion quotes. The 1990s came with a storm of new ideas and designs. Gucci, even though existing since 1921, reinvented itself after being bought by Invest Corp. Tom Ford also appeared in the scene, Prada reinvented itself by bringing ready-to-wear to the shoes and bags they were producing already. Michael Kors, Marc Jacobs and Calvin Klein were the most influential American designers of that time, and Marc Jacobs was offered a place at the helm of Louis Vuitton. Besides, a new scene was set for new and emerging designers, and this is where the Antwerp 6 were born, three of them being most influential: Ann Demeulemeester, Dries van Noten and Walter van Beirendonck. Besides them, Dolce & Gabbana and Versace broke away from the usual Italian seriousness and delivered great trends along with famous fashion quotes that will always be remembered. The 21st century brought novelty in the fashion industry through designers such as Alexander McQueen, John Galliano, Christopher Bailey for Burberry or Phoebe Philo for Celine. Besides them, as fashion is not all about clothes, there are models such as Kate Moss, Cara Delevigne and Naomi Campbell, who, even though some appeared in the late 20th century, have shaped fashion and perception in a way nobody else did. Besides them, magazine editors such as Anna Wintour, Alexandra Schulman, and creative minds such as Grace Coddington have shaped the way we read and see fashion, through their mesmerizing editorials and texts on a subject that fascinates the whole world. That’s how the following fashion quotes were born to life, from too much passion! Which of these famous fashion quotes was your favorite? Is there any quote you don’t agree with? Why? Share your thoughts with us in the comment section below!